GAIA - ¡Acepta el reto! ¡Acepta el reto! 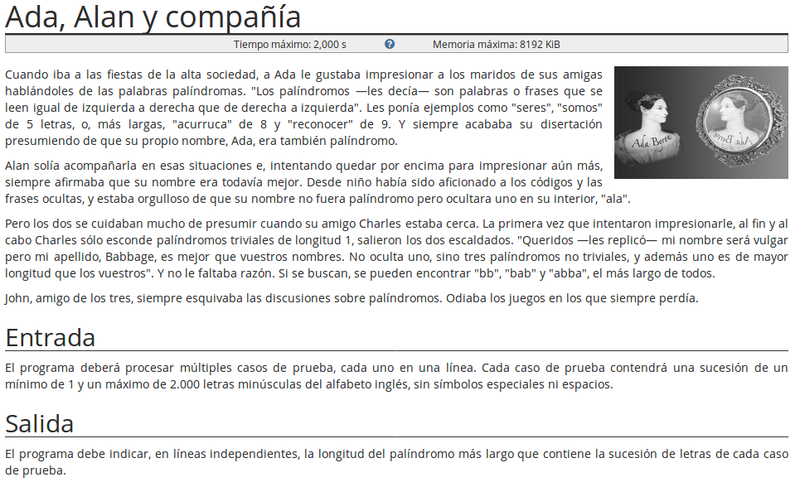 (Spanish translation of Take on the challenge!) 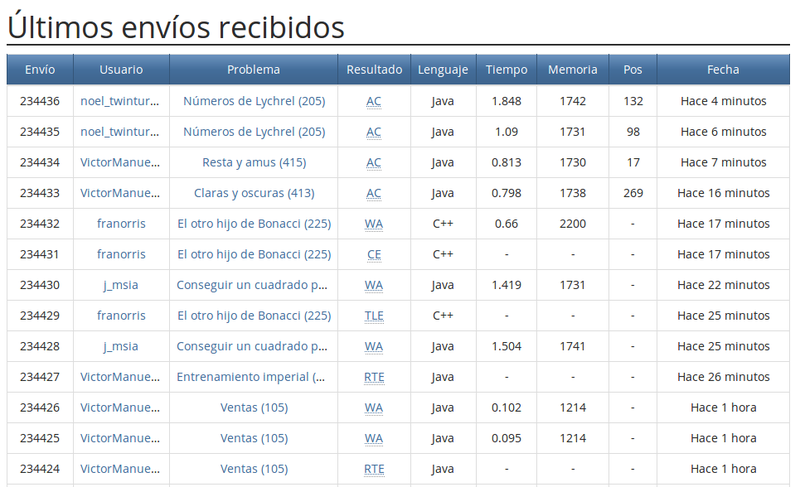 is a repository and online judge with more than 300 programming problems described in spanish. Users can submit solutions written in C, C++ or Java and the system will compile the source code and run it against many secret test cases. The output generated by the submitted solution is compared with that provided by the official valid solution and a verdict is provided in a matter of seconds. 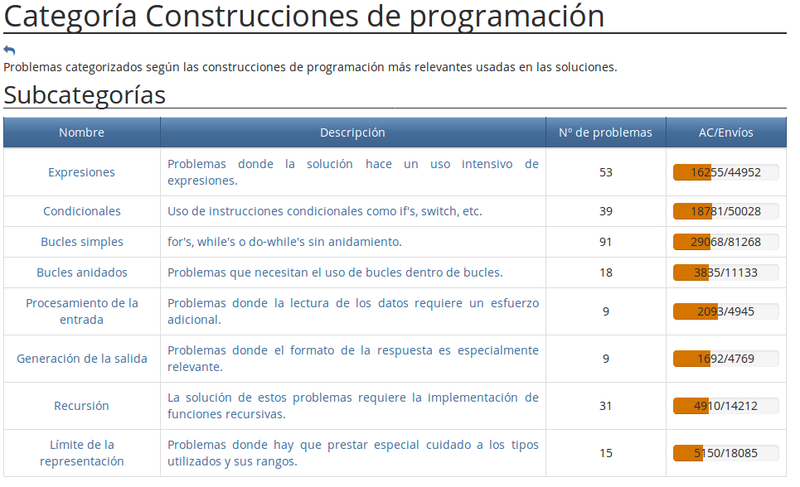 Wide range of problems' difficulty: many of the available problems are specifically designed for the first programming courses, but there are also problems related to complex subjects such as graphs or number theory. Both time and memory algorithm complexity evaluation: online judges usually only limit the total time available for the solutions to run, and are generous regarding memory limits. In ¡Acepta el reto! memory limit is usually as low as 4MiB even for Java solutions, so many problems are specifically designed to force small memory footprints. Spanish problem statements: many undergraduate spanish students have difficulties while reading english texts so english-based online judges are unsuitable for them. Categorised problems using different axes: problems can be browsed using different criteria such as the data struture they require, the algorithm family they belong to, or the main theme of their ambientation. Community-based textual hints: users can provide textual explanations for their own errors, and those tips are provided to future users making the same errors. 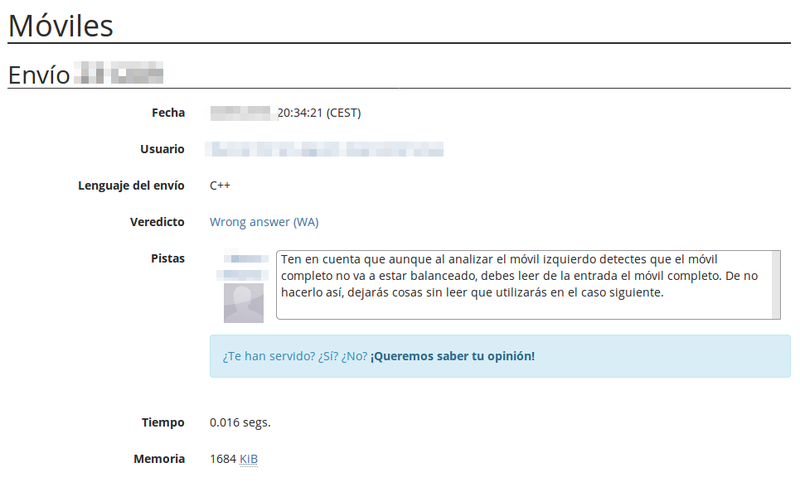 People in ¡Acepta el reto!